Wow - It's been a while. This weekend I found the Can-Cell and Yoda deluxe at target, as well as #50, Mustafar Ani. The week before I found the Spider Droid Deluxe and the Stass Allie w/ BARC. I did somethnig unusual and went to a Kmart that was in a shopping center with a grocery store I had to go to. Shelves and pegs were only about half full of SW merch, all older ones. But! But there was 1 AT TE pilot there for 6.99, so I snatched him up. Found the 500th Darth Vader at TRU on Sun. They also had a number of the MPire fig's, and some LEGO mini's on clearance. Dr E. I am heading through Deleware on Sat. Morning via i-95. ANy good spots there? Today (Fri) I found the Titanium ARC-170 and Ani-Vader Evolutions set at WM. Evolutions was still in its shipping box, wrapped in plastic on a pallet, and an associate was nice enough to open it up for me. Sat I'll probably get the Joiner King book at Borders while meeting KH. Drive safe Kid. So I got up to meet KH yesterday at TRU, but first I stopped at the Borders to get the Joiner King book. I got to TRU right at opening. I figured it was hot outside so i went in. I'm glad I did too. They had a black armor Clone Pilot, a green deco Clone Cmdr (figs 33 and 34), a couple 41 SA clones (already had a couple, got another tho) and Cmdr Bacara. They also had #50 quick change battle damaged Ani. Unfortunately I didn't see KH. Actually Dr. E, I hit some snags with departure time and didnt make it into De. until abnout 130 pm. I went to the TRU and didnt find anything. I forgot your # at home, so I couldnt call ya. I am sorry about it. We live close by anyways(a few hours) so maybe a few of us one day can get together around No. Va. and granb some dinner. A new WM opened near me. It happens ot be on one of the routes that I load at UPS, so I'm glad it finally opened (they usually get a little less packages once they're opened). Anyway, I drove over and they had the entire Hoth wave, which was the first time I've seen it in stores. 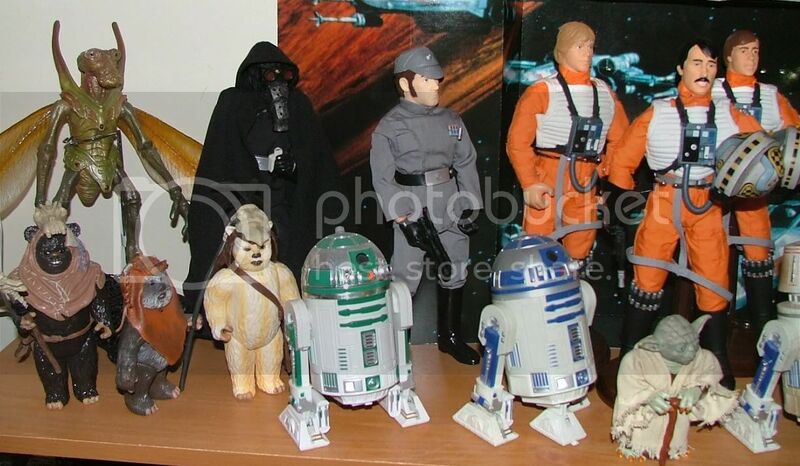 Got Veers, ATAT driver, snowtrooper, Derlin, the Gonk, and picked up 5 of the wooden based 12" "doll" stands. WM also had the new Obi Force battler... That is one of the ugliest pieces of plastic I've ever seen. Playskool Luke / Scout trooper w/ speeder bikes, Transformers. The Vader looks cool in package, but I never cared for transformers. They also had the LEGO ESB Slave 1. I wanted to buiy it just for the LEGO IG-88 and Dengar! The store was a lot nicer, and bigger then the other store I go to here in DE. This one looks more like the WM's that I've seen when I go down south. Today I received a couple of things... Koto Snowtrooper (SUPER SWEET! ), SWShop.com SpecOps trooper (just a different paint app from the Target version), and the EE droids - both packs. The paint app on the droids could have been a lot better. Recently, from eBay, I got vintage Micro collection Hoth, DS, and Bespin (complete sets), as well as loose 12" Target Luke and Wampa. I don't know if this technically qualifies for 'just found', but I just pre-ordered the SS ex Mace. I just don't feel like posting in multiple threads about the same fig. Oh - It was really quick and easy, too. I almost forgot all about it. Here are some pics of some of my 12" collection. To keep them standing I'm using a combination of all white metal stands, and some of the wood / metal stands from WM that someone recommended. Found Bultar Swan at Target the other day. There was a guy standing there with a couple Jedi from the Coruscant wave too. No more on the pegs tho. Forgot to post that one of the TRU's that closed is (was) in Springfield, DelCo, PA, which is the one closest to where my parents live. Haven't made my way to Media to see if that was closed also. Luckily, the one here in Newark is still open. It has a great location, right next to I-95, reachable by customers in 4 different states(if you include DE. Others are PA, NJ and MD.) within about a 20 min drive. At WM yesterday I found Scorch, and at Target I found the Utapau Clone and Foul Modeema (or whatever his name is). Still forgot to get the Easter Egg kit though. I never did get that Easter Egg kit. I did return to Target yesterday though. I found the 2nd firefighter that I wanted, as well as all the vintage fig's except for the scout trooper. The vintage fig's were 11.99, I think they were still 9.99 at TRU (where I got Greedo a week or 2 ago). I only make it out shopping about once a week now. If anyone that might happen to read this has scout's in their area could pick one (or four ) up for me I'd greatly appreciate it Thanks! edit: Just now opening the Tusken. The clamshell was sealed using some sort of heated crimping device, whereby opeing the package destroys the clamshell. I don't know if this is just Target or not, as the Greedo from TRU was sealed with tape, as was the 1st vintage wave last year. Some of the VTSC were taped, but most are heat sealed to avoid people stealing the tabs. 2 days ago I received my TC-14 bust (chrome plated 3PO) SWS.com. I had ordered the Lucas Family, too, from them, and it still hasn't arrived even though it shipped first. Today I got the CW deco gunship from TRU, will be opening it shortly. It's been a while since I've posted here. On Sun I found a R5 - D4 and a 501st trooper at TRU. 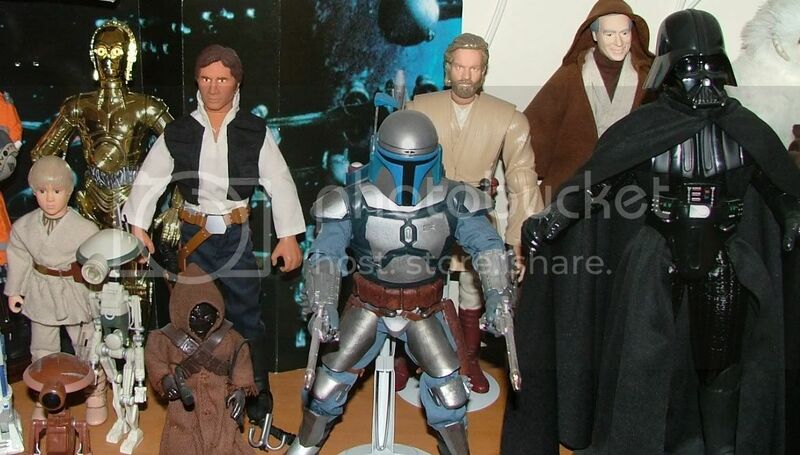 Still looking for the Sandtrooper and the ANH Luke from that set. 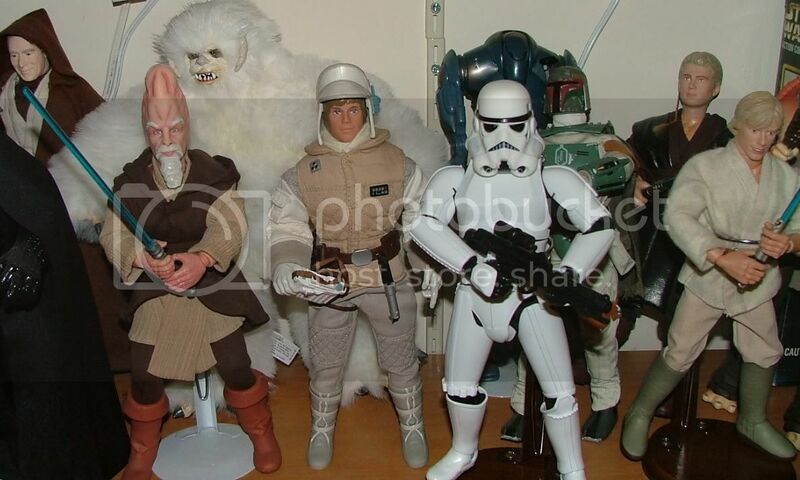 Tonight I found the Ewok Throne 3PO, Jerjerrod, and a Shocktrooper. My SS Han excl was shipped and should arrive Mon. Rec'd notification that my card will be charged in a couple days for the Mace excl. I got my SS Mace on Tues, and am expecting another SS fig today (forget which one). Now I just have to go and open them all up... The only SS I've opened so far has been Luke. 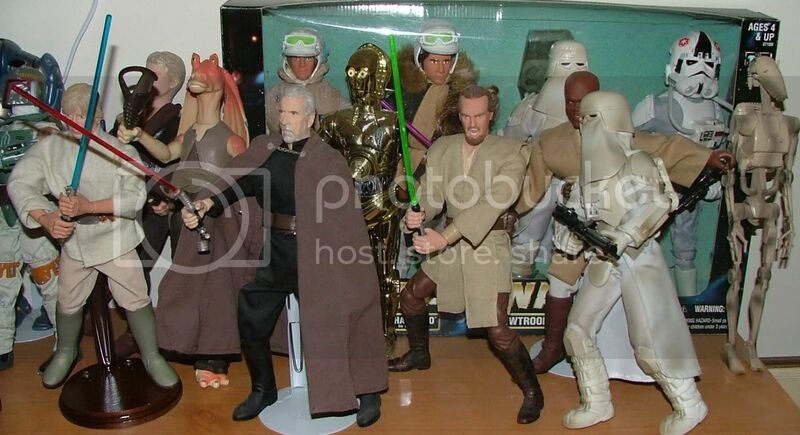 More good SS news for me - my Wait-List for Sith Ani SDCC Excl was converted to a real order! Yay! I had missed both versions of Ani. Looking forward to reserving Plo Koon today. Reserved my SS Ex Plo Koon. SDCC Ani-vader should arrive Mon, and just received tracking for Qui Gonn, which should arrive 9/28. I need to follow up on Clone Busts and try to get an estimated shipping for the Fett blaster from MR.